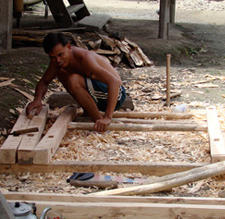 In Laos, husbands, uncles, fathers, and brothers carve and build the looms for the women. 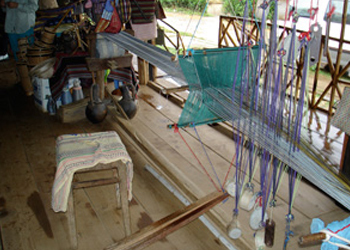 An assembled Laos loom with the warp strung. 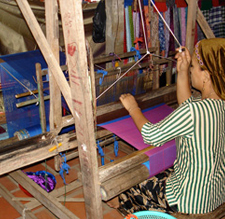 A Vietnamese woman weaving a plain weave scarf using an "automatic" shuttle return in the Mekong Delta. 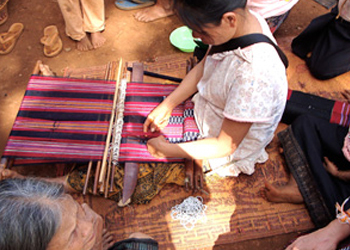 Supplemental Weft: Khao Ti Die and Brocade patterning. 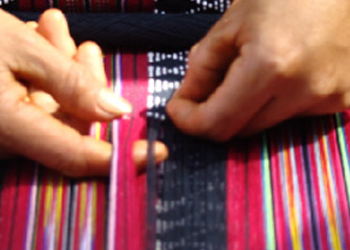 A Lao woman hand-picking a pattern in a long story-cloth type textile. Since the pattern does not repeat, she has to pick out each row based upon her mental pattern, or based upon a previously woven textile she uses as a template. 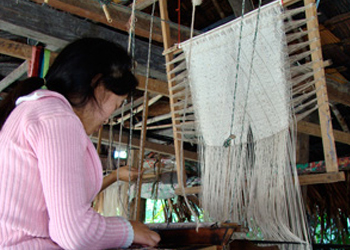 This loom does have a small "khao ti die" shaft for the border pattern. 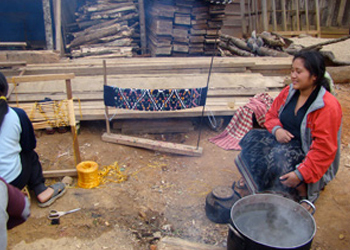 Young Laos woman weaving a shaman cloth on a loom with "khao ti die" pattern shaft. 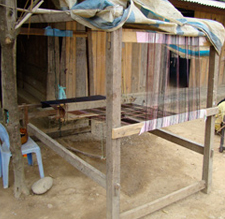 The "khao ti die" pattern shaft used on the loom to the left. Looking closely, it is possible to see the pattern that will emerge in the textile. "Khao ti die" translates as "vertical and horizontal". The vertical strings are actually two strings looped together through which each warp thread goes. The pattern is hand picked using the horizontal thread as a place-holder for each row of weaving. When the horizontal thread is taken off of the pegs holding it in place on either side of the verticals and moved back and forth to open up the pattern, the vertical strings separated in that fashion are lifted up, the sword is put between the separated threads, and the horizontal pattern thread is placed below the warp on corresponding pegs to hold the pattern for its next use. 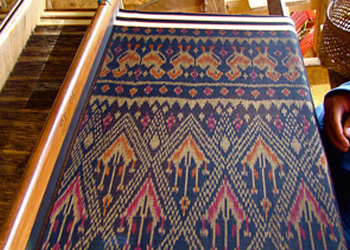 The "khao ti die" pattern shaft pictured from the back of the loom, showing how the pattern is carried from above the warp to below to preserve the pattern for future weaving. A young woman preparing to wind the bobbins of mat-mi in preparation for weaving. 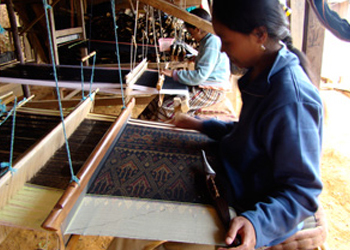 Mat-mi being tyed on plain silk, and mat-mi that has already been dyed several times – making the final pattern discernable. 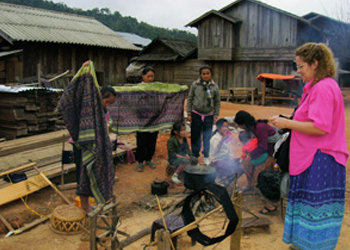 Women in Houaphon Province, Laos, selling me a skirt-length of their handwoven mat-mi fabric, with all but the weaving portions of the task in progress. 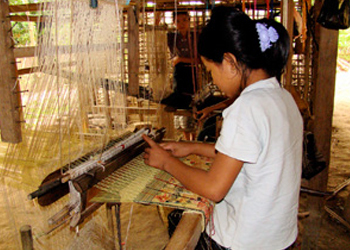 A girl in Houaphon Province, Laos, weaving a mat-mi textile on a floor loom. 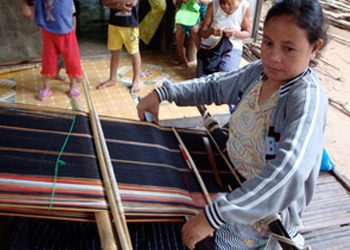 Woman in Houaphon Province, Laos, weaving a mat-mi textile on a floor loom. Another view of the mat-mi weaving. 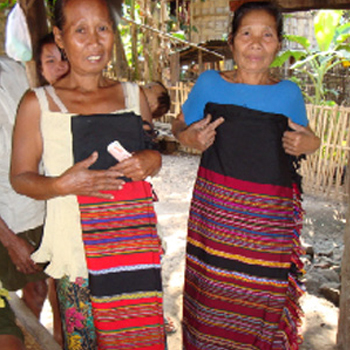 Two women in Sekong Province in Laos showing their warp design textiles woven with a circular (ends tied together) warp. 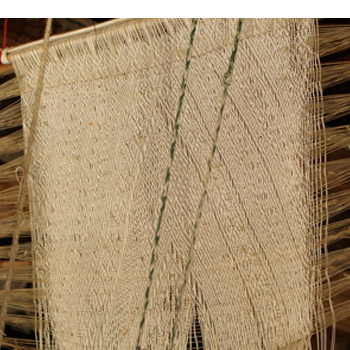 A warp design loom with weighted heddles. 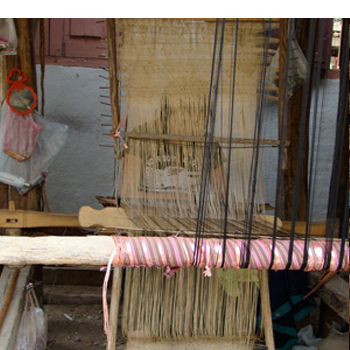 The weaver sits sideways with the warp going from left to right as she weaves. 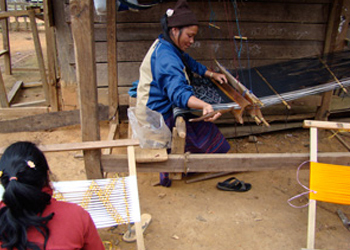 Woman in Vietnam using a backstrap loom in which she picks the patterns. 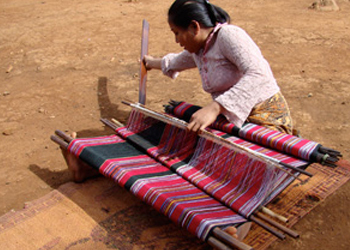 Bahnar woman (see hybrid loom below) handpicking warp design into a cotton blanket. 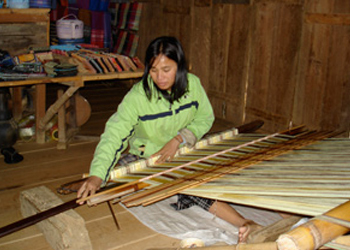 Katu woman weaving a skirt on a wide backstrap loom in Sekong Province, Laos. 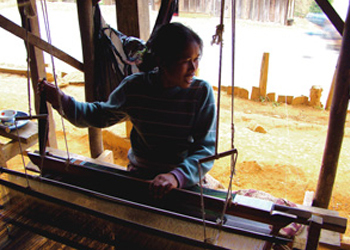 Katu woman weaving a beaded shawl on a backstrap loom in Sekong Province, Laos. 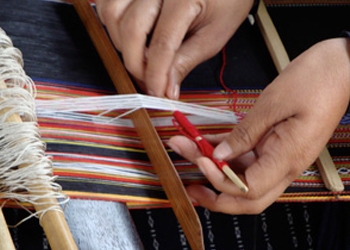 Placing the beads strung on the weft threads in the correct position for the pattern. 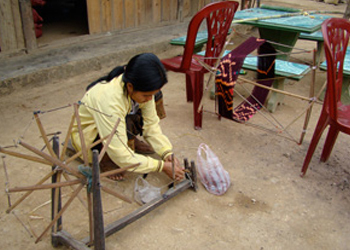 This Bahnar woman in Kon Tum Province, Vietnam, is weaving on a modified backstrap loom. 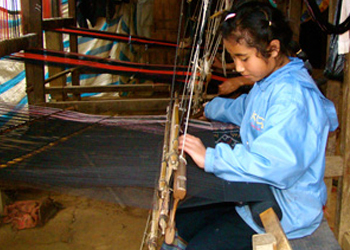 This loom has been modified to accommodate her disabilities, but many looms we saw while traveling have been modified in a similar manner – half backstrap, half floor loom, particularly in southern Laos and central Vietnam.